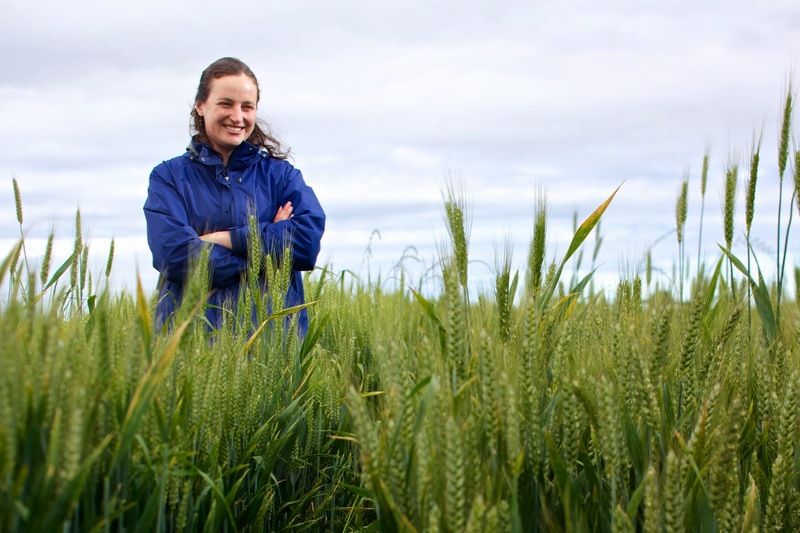 Agricultural research by a Washington State University graduate student brings Alaska a step closer to a wheat variety adapted to the far north. Karen Hills conducted research on wheat varieties for Alasaka at Mount Vernon Vernon Research Center in Washington. Karen Hills, who grew up in Fairbanks and worked summers at the University of Alaska Fairbanks Large Animal Research Station during high school, crossed several types of wheat to try to achieve a hard red spring variety that matures early and is shatter resistant. Most of her work was done at WSU’s Mount Vernon Research Center but she visited the Fairbanks Experiment Farm at UAF to see how the wheat was growing. “This was a great opportunity to see how I could collaborate with UAF folks to benefit the work in Alaska,” Hills said. “We chose varieties that show promise.” They were Ingal, Roblin, AC Intrepid and CDC Bounty. Professor Mingchu Zhang at UAF said the primary purpose of Hills’ research was to overcome the shattering issue of Ingal in the state’s short growing season. “After crossing, we are now in the field and selection processes,” Zhang said. Over the past three years, he’s had only one year of reliable data due to extreme weather conditions. “We will continue for the selection until we select a no shattering, short growing wheat variety for Alaska,” he said. One farmer in Palmer grew the new wheat in 2013, and sold all his products in Anchorage markets. Hills, who earned a Ph.D. in crop science from WSU, credited Glen Franklin of Delta Junction for helping fund her research. Franklin, retired from the Alaska Division of Agriculture, established an endowed graduate fellowship in crops and soils at WSU, stipulating that the research should benefit Alaska and Washington. Hills began her work in the WSU greenhouses at Mount Vernon, grew the new crosses in the field and provided germplasm to UAF researchers Zhang and Bob Van Veldhuizen. The work continues now at UAF. “We need to make continued evaluations of the three crosses for agronomic qualities, non-shatter seed when ripe, early maturity, high yields, no lodging, all compared to the same agronomic qualities of the parents Ingal and the three Canadian wheat varieties,” Van Veldhuizen said. “We need to do this over a number of years to rule out goofy weather conditions like the drought of 2013 and the cool wet of 2014 at Fairbanks, Delta Junction and Palmer to see if it does better at one location. And then after comparing the three crosses we need to evaluate at least one, perhaps all three if all three are good enough, for milling and baking qualities. He said another potential graduate student project at WSU would be evaluating the genetics within each cross to look at the genes for early maturity to determine if there is a link between early maturity and head shatter. “The biggest problem will be how to do all this in times of increasing budget restrictions,” he said.